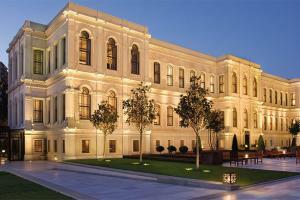 The Four Seasons Hotel Istanbul at the Bosphorus offers an unforgettable retreat on the shores of the scenic Bosphorus. Set at the edge of Europe with a view towards Asia and housed in a beautifully restored 19th-century Ottoman palace, the hotel showcases historic architecture and contemporary accommodations elevated by warm Turkish hospitality. Expansive guest rooms and suites blend a modern aesthetic with centuries-old architectural details. Enjoy the warm Turkish sunlight and panoramic waterfront, garden and city views from large windows. Located 16 miles (approximately a 45 minute drive) from Istanbul's Ataturk International Airport. Aqua - Mediterranean Fine Dining; YALI Lounge; Pool Grill. Dolmabahce Palace, Yildiz Park, Naval Museum, Istanbul Archaeological Museums.